Les Nabis (pronounced nah-BEE) were a group of Post-Impressionist avant-garde artists who set the pace for fine arts and graphic arts in France in the 1890s. Initially a group of friends interested in contemporary art and literature, most of them studied at the private art school of Rodolphe Julian (Académie Julian) in Paris in the late 1880s. In 1890, they began to participate successfully in public exhibitions, while most of their artistic output remained in private hands or in the possession of the artists themselves. By 1896, the unity of the group had already begun to break: The Homage to Cézanne, painted by Maurice Denis in 1900, recollects memories of a time already gone, before even the term Nabis had been revealed to the public. Meanwhile, most members of the group—Maurice Denis, Pierre Bonnard, Édouard Vuillard—could stand, artistically, on their own. Only Paul Sérusier had problems to overcome—though it was his Talisman, painted at the advice of Paul Gauguin, that had revealed to them the way to go. Homage to Cézanne, Maurice Denis, 1900. Musée d'Orsay, Paris. Nabi means prophet in Hebrew and in Arabic. Les Nabis originated as a rebellious group of young student artists who banded together at the Académie Julian. 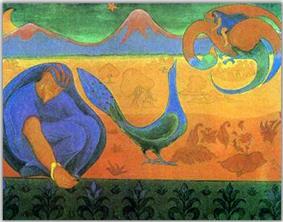 Paul Sérusier galvanized Les Nabis, and provided the name and disseminated the example of Paul Gauguin among them. 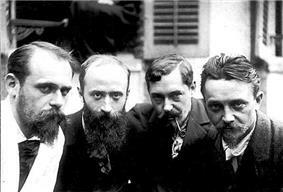 Pierre Bonnard, Édouard Vuillard and Maurice Denis became the best known of the group; at the time, however, they were somewhat peripheral to the core group. The term was coined by the poet Henri Cazalis who drew a parallel between the way these painters aimed to revitalize painting (as prophets of modern art) and the way the ancient prophets had rejuvenated Israel. Possibly the nickname arose because "most of them wore beards, some were Jews and all were desperately earnest". Meeting at Académie Julian, and then at the apartment of Paul Ranson, they preached that a work of art is the end product and the visual expression of an artist's synthesis of nature in personal aesthetic metaphors and symbols. They paved the way for the early 20th-century development of abstract and non-representational art, and they had in common with most progressive artists of the time the goal of integrating art and daily life. Les Nabis artists worked in a variety of media, using oils on both canvas and cardboard, distemper on canvas and wall decoration, and also produced posters, prints, book illustration, textiles and furniture. Considered to be on the cutting edge of modern art during their early period, their subject matter was representational (though often symbolist in inspiration), but was design oriented along the lines of the Japanese prints they so admired, and art nouveau. 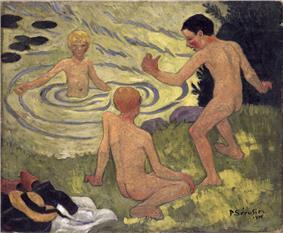 Unlike those types however, the artists of this circle were highly influenced by the paintings of the impressionists, and thus while sharing the flatness, page layout and negative space of art nouveau and other decorative modes, much of Nabis art has a painterly, non-realistic look, with color palettes often reminding one of Cézanne and Gauguin. 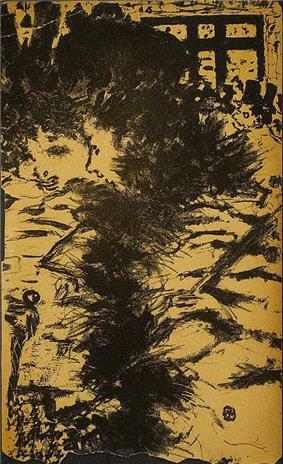 Bonnard's posters and lithographs are more firmly in the art nouveau, or Toulouse-Lautrec manner. 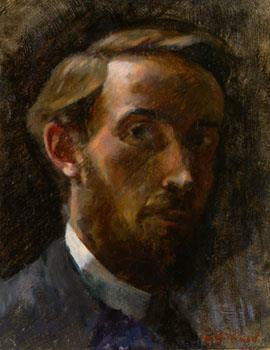 After the turn of the century, as modern art moved towards abstraction, expressionism, cubism, etc., the Nabis were viewed as conservatives, and indeed were among the last group of artists to stick to the roots and artistic ambitions of the impressionists, pursuing these ends almost into the middle of the 20th century. In their later years, these painters also largely abandoned their earlier interests in decorative and applied arts. 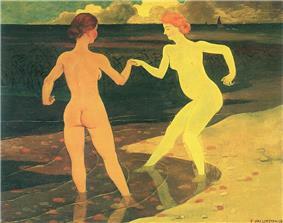 Among the artists who considered themselves Nabis was Maurice Denis, whose journalism put the aims of the group in the eye of a progressive audience, and whose definition of painting – "a flat surface covered with colors assembled in a certain order" – expressed the Nabis approach. His Théories (1920; 1922) summed up the Nabis' aims long after they had been superseded by the fauve painters and by cubism. 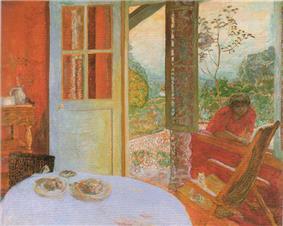 Other Nabis were Pierre Bonnard, Édouard Vuillard, Ker-Xavier Roussel, Paul Ranson and Félix Vallotton. The sculptor Aristide Maillol was associated for a time with the group. The Scot, James Pitcairn-Knowles and the Hungarian, Jozsef Rippl-Ronai, lived together in Paris during the first decade of the 20th century and also turned to glass blowing and wood carving. The post-Impressionist styles they embraced skirted some aspects of contemporary art nouveau and Symbolism. The influence of the English Arts and Crafts Movement set them to work in media that involved crafts beyond painting: printmaking, book illustration and poster design, textiles and set design. 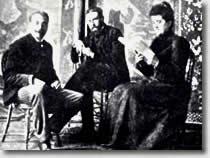 Other members of the group included the playwright Pierre Veber, musician Pierre Hermant and linguist Auguste Cazalis, called (by Ranson) le nabi Ben Kallyre Casilis. 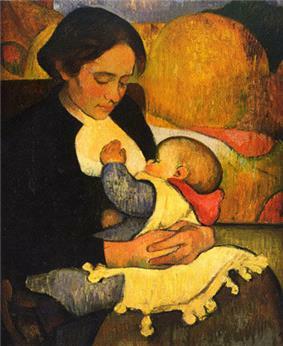 Meyer de Haan, Maternity: Mary Henry Breastfeeding, 1890. ^ The French term nabi (also used in English) refers to a person inspired to speak the word of God is clearly related to the Hebrew term for prophet — נביא (navi) — and the similar Arabic word نَبِيّ (nábi). The word appears in many languages, including Indonesian. ^ G.L. 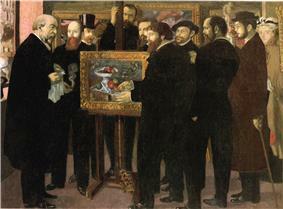 Groom, Edouard Vuillard: Painter-decorator: Patrons and Projects, 1892-1912 (Yale University Press, 1993), p. 10. ^ Many of the attributed nicknames are cited in Willibrord (Jan) Verkade, Die Unruhe zu Gott: Erinnerungen eines Malermönchs, 5th Edition (Herder & Co., Freiburg im Breisgau 1930), pp. 67-70. The Prophets of Montmartre Ashe Journal article on Les Nabis by Alamantra.